ARM HEIGHT: 29", ARM WIDTH: 4"
The Laurel Lounge Chair features a dramatic open back, tight upholstered seat, and a softly rounded silhouette. 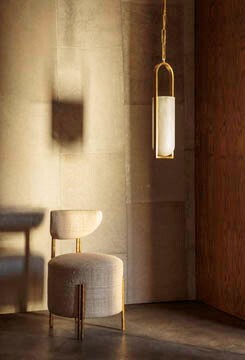 It rests on tapered cast brass legs in burnished brass. Sublimely comfortable and ideal for lounging. The hardwood frame features double-doweled joinery and is built for longevity. Available in a selection of curated fabrics and leathers.